ASICS introduces the GEL-Kinsei® 4, the brand’s most innovative top-of-the-line running shoe to date. Since its introduction in 2005, the GEL-Kinsei series has been known as ASICS’ “House of Innovation” referring to pioneering technological advances that were first debuted in this model. 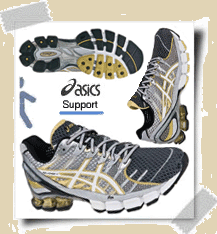 These technologies have gone on to become components in several other performance models in the ASICS collection. 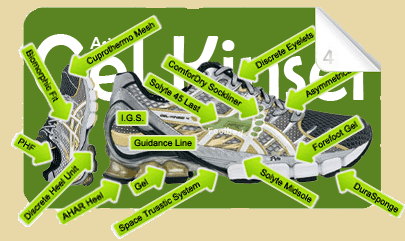 Improving and reducing the weight of existing technologies to improve the shoe’s overall performance was the focus for the fourth version of the GEL-Kinsei. The result is notable with almost a full ounce being shaved off from the previous model taking the shoe from 12.8 ounces to a lightweight 11.9 ounces. reduced synthetic reinforcements and overlays in the upper, enhancing the comfort and fit. The shoe will continue to use Cuprothermo™ mesh in the upper, which helps temperature control of the foot by retaining heat in cool weather and releasing it in hot weather. AHAR™+, Heel : A thinner and lighter version of Asics High Abrasion Resistance rubber. It is placed on the impact area of the outsole to reduce excessive wear. Biomorphic Fit™ : Provides enhanced upper fit and comfort while decreasing potential for irritation. Cuprothermo™ Mesh : Asics advanced upper material designed to aid temperature regulation within the shoe through effective heat distribution and enhanced moisture management, by retaining heat in cool weather and releasing it in hot weather. DuraSponge®, Forefoot : A new blown rubber compound for enhanced durability and cushioning in the forefoot. Gel®, Forefoot n Heel : Provides maximum rearfoot and forefoot shock attenuation. Guidance Line™ : Vertical flex groove decouples the tooling along the line of progression for enhanced gait efficiency. Heel Clutching System : Exoskelatal heel counter provides improved support and creates improved heel fitting environment. I.G.S.® : Impact Guidance System : Asics® design philosophy that uses linked componentry to encourage optimal gait while allowing for natural foot movement from heel strike to toe-off. PHF™ : Personal Heel Fit System : Moulds and customises itself to the individual heel shape of the wearer. Space Trusstic System™ : The system works with the complex functions of the foot to facilitate Windlass Mechanics. Space Trusstic is new I.G.S. componentry and an evolution, if not revolution of our benchmark trusstic technology. The Space Trusstic system is not integrated within the EVA. Rather it is suspended below the midsole EVA forming a distinct pocket or space into which the EVA of the mid foot section of the shoe can distort. The result is that torsion stability of the shoe is maintained but pressure on the plantar facia is released enabling tension with the transition from foot flat to propulsion. This is designed to facilitate the all-important Windlass Mechanism. Space Trusstic is a natural extension of I.G.S. and an enhancement of Windlass Mechanics. Solyte™, Midsole : The advantage to injected Solyte® is a much more consistent density, ensuring that the desired softness is more ‘dialed in’ than standard compression molded midsole material. Injected Solyte® is also lighter than standard Solyte® contributing to the overall drop in weight.